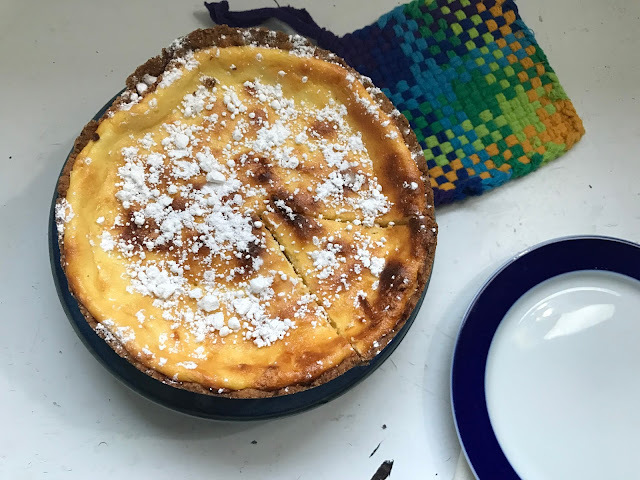 A light summer cheesecake made with Jersey Girls Farm's fresh quark cheese. What could be better? I hustled behind the tape, but in fact the cows accepted me rather well; there was a bonding moment with the lead cow, who gave me a careful sniff and walked on. These are beautiful animals, with glossy caramel coats, delicate faces, and oddly graceful gait. Their milk is superb, high in butterfat, delicious to drink, and wonderful for cheesemaking. I traveled to Switzerland and Haute Savoie this summer, and was struck by the commitment of farm cheese producers to their pastures and to their animals. Lisa has that same commitment, and her healthy herd shows the results. And the cows reward all this caring and effort with great milk, and lots of it. Lisa sells raw milk, pasteurized milk, cream, butter, buttermilk, and a very interesting product... Quark cheese. This is not a subatomic particle, but a fresh lowfat cheese in the German tradition. It looks a bit like ricotta, but is more sophisticated, because it is made with a culture to develop flavor and richness. 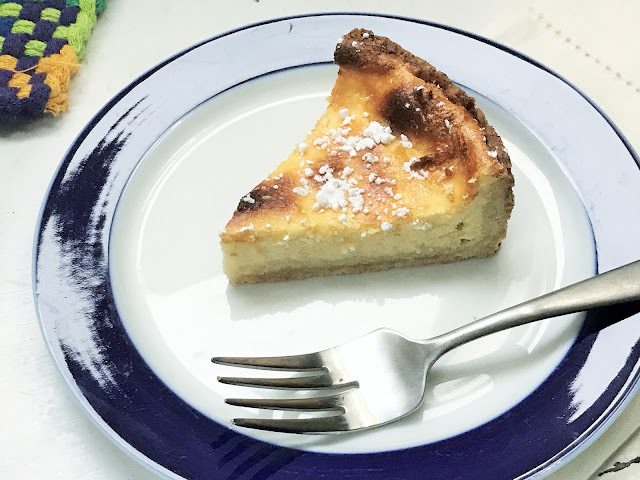 It is very useful for all kinds of cooking; this recipe is a dessert tart, but Quark can be used in both savory and sweet dishes, as well as baking. 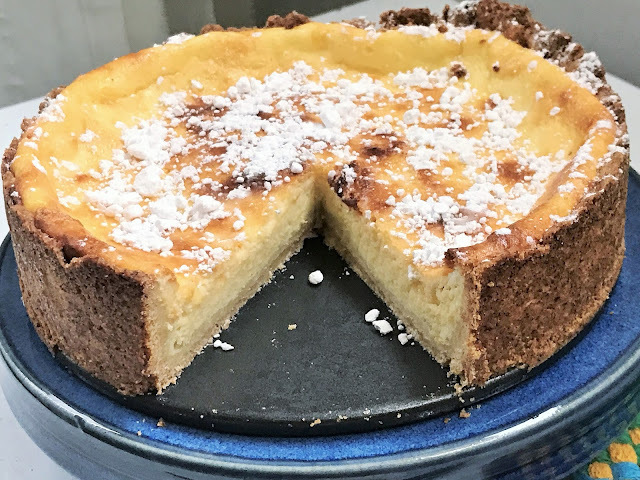 A German-style cheesecake (Käsekuchen) which uses fresh, lowfat Quark cheese. Instructions are given for two sizes: for a large (10") or smaller (6") tart. 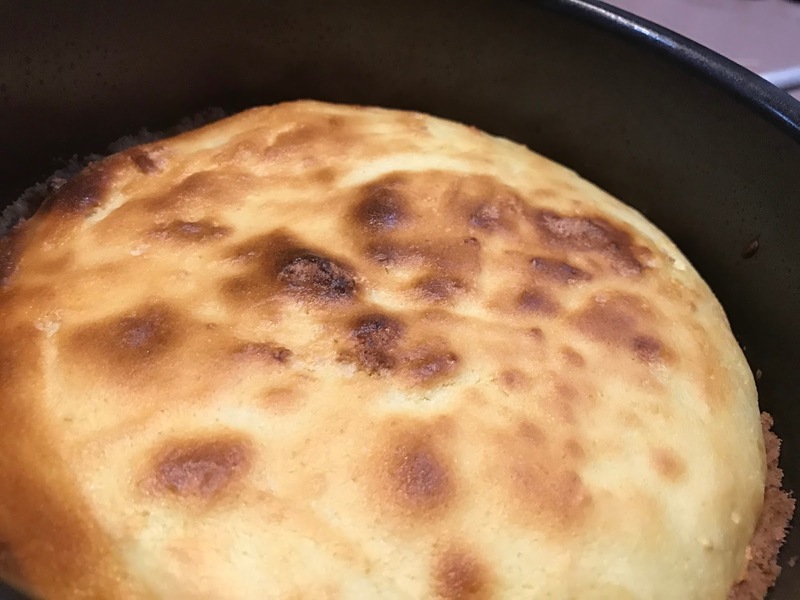 Blend the crust ingredients in a food processor to make a soft dough, then line the bottom and 2" up the side of a greased springform or removable-bottom cake pan with it. Lay a piece of plastic wrap over the dough to help smooth it on the bottom of the pan. Pre-bake the crust at 375 degrees for approx. 7-10 minutes, until just brown on the edges. Set aside while making the filling. Mix all the ingredients except for the egg whites for two minutes, until light. Beat the egg whites and sugar to stiff peaks and carefully fold into the curd mixture. Gently scoop the filling into the prepared crust, and distribute it lightly to the edges. If desired, swirl 1/8 cup of preserves or diced fruit into the surface of the tart before baking. Bake at 325 degrees 60-70 minutes. It will be lightly puffed when first removed from the oven. Test with toothpick in center to ensure doneness. Let sit for 5 minutes, then run a knife around the outside of the crust and remove from the springform/cake pan. Cool completely on rack, then refrigerate. Afterwards, dust with powdered sugar just before serving. Try this tart, I am sure you will like it!